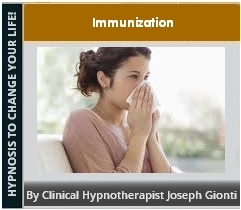 Just like getting an annual shot to better defend, protect, and prevent yourself from contracting the flu, why not use the power of your mind to keep yourself, your family, and loved ones healthy and safe by creating a powerful immunity to diseases, illnesses, and sickness like the Flu, the common cold, and even new threats like Ebola? There is historical precedent that dates back to the early 1840's with a surgeon named Dr. James Esdaille, who has been discussed by Dr. Joseph Murphy in several of his books. The majority of patients in those times did not die of surgery but rather, they died of the infections that followed. This is because back then there was no concept of modern sanitation, so they would simply throw a bucket of water on the operating table, lay the next patient down, then they would proceed to use the same unwashed tools as they operated on the next patient. In fact, good surgeons were commonly known by how much blood they had on their apron. The more blood, the more surgeries, the better the surgeon. It was surprising that anyone survived the infections for which there were no antibiotics! Dr. Esdaille had started using hypnosis for anesthesia. Hearing of Fran Messmer, he decided to add the suggestion that the patient would get no infection. In over four hundred major surgeries he had only a 2% infection rate. It was a miracle. The bodies through the power of the subconscious mind switched on their ability to say "no" to infection. This Hypnosis program works exactly the same way. Through this program, you will be using the power of your subconscious mind to switch on your own ability to say "YES to keeping healthy by fighting off sickness - while saying "NO" to contracting diseases, illnesses, and sickness like the Flu, the common cold, and even threats like Ebola. The best part is that since there are new diseases, illnesses, and sickness being uncovered all the time, you can continue to use this program to keep yourself, your family, and loved ones healthy and safe for years to come. Follow these simple tips and directions and YOU TOO, will the begin to enjoy the healthier life that you deserve.